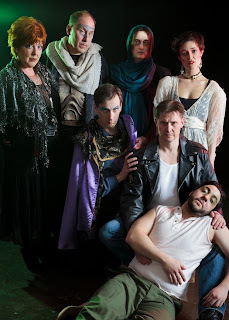 I love the plays of Tennessee Williams - from the well known A Streetcar Named Desire and Cat on a Hot Tin Roof, to the lesser known Summer and Smoke, to one of my favorite plays - The Glass Menagerie. He has a gift for creating these very real worlds full of complex characters (women especially), stories of such tragedy and beauty and emotion, set in a specific time and place in history. 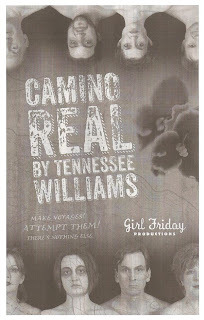 At first glance Camino Real, in a rare local staging by Girl Friday Productions, bears no resemblance to the Tennessee Williams plays I know - surreal instead of naturalistic, with a huge cast of characters, some drawn from literature, no linear storyline, set outside of time and place. It's a strange trip through the 16 blocks of the Camino Real (purposely mispronounced as CAMino REal). At the end of it I was a little perplexed, but also moved in a way I couldn't quite explain. Camino Real is about death, love, fear, loneliness, hope, just like all of Williams' plays, only in a more abstract sort of way. Stick with it through all the craziness, and you might just find those moments of beauty, truth, poignancy, and tragedy that Tennessee Williams does so well. Don't pity yourself! The wounds of the vanity, the many offenses our egos have to endure, being housed in bodies that age and hearts that grow tired, are better accepted with a tolerant smile - like this! - You see? Otherwise what you become is a bag full of curdled cream - leche mala, we call it! - attractive to nobody, least of all to yourself! There's not a weak link in the 14-person cast, ably directed by Benjamin McGovern (who also designed the sparse and surreal set). Eric Knutson is a great Kilroy, the likeable and relatively normal presence that leads us through the crazy trip. Alan Sorenson is smooth as the all-knowing Gutman, and Craig Johnson is compelling as the dreamer explorer Quixote, as well as in an amusing turn as an old man. Kimberly Richardson is always entertaining as she physically transforms into one odd character or another. The hauntingly beautiful voice of Laurel Amstrong adds to the ambiance of the Camino. John Middleton and Kirby Bennett (Girl Friday's Artistic Director) play out the most emotional scenes, between Cassanova and Marguerite, who bears the closest resemblance to the familiar Williams heroine - desperately trying to get out of the situation she's found herself in. I haven't read any yet, but I've heard that this play has received mixed reviews, with some critics loving it, and some not so much. If anything that made me more excited to see it and decide for myself. It's definitely odd, and I wouldn't say it's my favorite Tennessee Williams play, but I appreciate the opportunity to see more of his work, especially this piece that's so seemingly different, yet has moments of familiarity. I found a lot to like. But it's weird for sure, and I can see how it's not everyone's cup of tea. For a theater company that only does one production every two years, this was a big risk for Girl Friday to take, and I have to admire that. This is a much different Street Scene than the one they presented two years ago. In my opinion, the risk paid off, and I can't wait to see what 2015 brings! If you're also intrigued by the response and want to see what the fuss is about, the play continues through July 27 at the Minneapolis Theatre Garage, with discount tickets available on Goldstar.